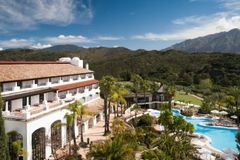 The luxurious La Quinta resort is nestled in the heart of Marbella's golf valley, located only minutes from the golden sand and azure blue water of the coast, and the boutiques and nightlife of Marbella and Puerto Banus. The accommodation is the picture of 5-star luxury, beyond the opulent rooms you will find a host of first-class facilities. As with the hotel, the golf at La Quinta is exceptional, with stunning vistas from the mountains to the ocean. Comprised of three unique loops of nine holes, each layout is stunning and challenging in its own right and all were designed by the legendary Manuel Pinero, a member of Europe's 1985 Ryder Cup winning team. San Pedro is the original course at La Quinta, and forms the backbone of the toughest course make-up. There is a good variety of holes, with some delightful par-3s being off-set by exacting long holes, where finding the correct position off the tee is crucial. The highlight is the 5th, where the fairway is banked on either side by mature pine trees and out-of-bounds. Named in honour of a beautiful local village, the Ronda course will test the precision and accuracy of every golfer with undulating fairways and fast, difficult greens. There are blind tee shots to be negotiated, while the most demanding proposition is undoubtedly the long 6th, requiring three good strikes to find the target. Set against the backdrop of the awe-inspiring Sierra Blanca mountain range, the Guadaiza is the newest addition to La Quinta Golf. It is also the longest of the three loops, demanding powerful and accurate drives. Negotiating the three successive par-5s is the key to mastering the Guadaiza. La Quinta is home to the International Golf Academy, where Manuel Pinero leads an outstanding facility that runs dedicated tuition and instruction clinics. Set amidst the stunning gardens, the hotel has a wide range of high quality guest rooms from deluxe, grand deluxe and ‘workout' rooms to opulent suites, all of which are perfectly equipped to ensure total comfort and relaxation. All rooms reflect the traditional Andalucian style, with recurring motifs such as terracotta tiles and woven cane furniture. Bedroom amenities include climate control, while the private balconies and terraces allow guests to relax and enjoy the views over the golf course and the surrounding hills. Arguably among the finest hotels in all of Andalucia, La Quinta is the choice for the traveller seeking added luxury as part of a golfing holiday. La Quinta's amazing spa is brand new, and has been influenced by the Arabic and Andalucian heritage of the region. Every single feature has been specifically designed to soothe all the senses, while the complex is complete with wet and dry areas, a sauna, Turkish bath, jacuzzis, massages, rassul therapy and aromatherapy. There is an enormous outdoor swimming pool with surrounding sun terrace, and also a well-equipped gym with state-of-the-art training equipment. If you're feeling thirsty, choose from the amazing Arabian themed Aljama Lounge, or chill out with a cocktail at the El Mirador Pool Bar. The Kaede Japanese restaurant is perched above the dramatic coastline, where bold Eastern dishes are served at communal teppanyaki tables. At the Los Arcos Restaurant, age-old local flavours are fused imaginatively with the best in modern international cuisine. Renovated large rooms but you can feel that it was a soft renovation. Nice breakfast and very friendly staff. Accommodation was perfect for what was needed, facilities were excellent and rooms of a high standard. Cleaned, towels refreshed and beds changed daily. Food in the club house was of a highest standard and excellent value for money. However only small negative was that the drinks prices were way above average even for Marbella. Staff at the resort were hugely atttentative and helpful and were always willing to go above and beyond. Resort location was OK, and only a small taxi fare into the centre of Banus for those who wanted to sample the nightlife. Course was the most affected by the weather bunkers were unplayable but despite this our favourite course the holes are all different. Drinks expensive in bar. We arrived at La Quinta following torrential rain and flash flooding on the Costa Del Sol. This resulted in our first round being delayed and one of the loops of the course closed for the first 3 days. This was understandably out of the staffs hands but they did everything in their power to accommodate us and get us playing as much golf as possible. The course was quite obviously damaged due to the adverse weather and bunkers pretty much unplayable, landslides had occurred on different areas and a lot of standing water on the course. To reiterate this was not a negative of the resort just unfortunate circumstances of events and I will definitely be returning earlier in the year to see the course in its full glory. As I can imagine it would be perfect. In all a great resort for golfers of all standards, those with shots can score well, and those with a lower handicap Know they have played well if they walk off hitting their handicap. Holes are picturesque with some great views. Great course. Good test for all. Good views. Really enjoyed playing here. This was undoubtedly the best of the 4 courses we played and in the best condition -- would certainly play again. Well looked after in the bar. Three 9 hole courses played as a loop of either a+b/ a+c/ b+c ; it is a hard course but an enjoyable experience and for all handicaps.